With the release of NASM’s new Nutrition Certification, over the coming weeks and months we will be sharing recipes for some of our favorite delicious and nutrition meals. Whether you’re vegan, vegetarian or follow a less restrictive diet, we’ll have options for everyone. 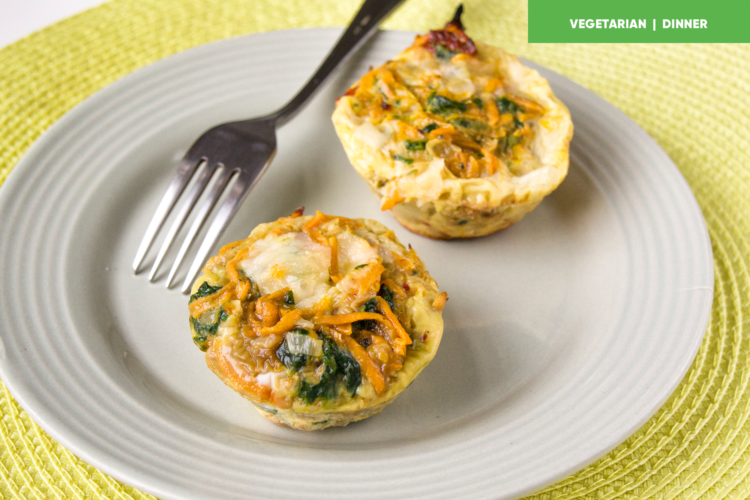 This week we start with a vegetarian dinner option, the sweet potato egg cakes. Place the frozen spinach into a colander to thaw and then squeeze out as much liquid as possible. Preheat the oven to 375°F. Heat the oil in a large skillet over medium heat. Add the onion and salt and cook for 4 minutes, stirring occasionally, or until softened. Add the sweet potato and heat until the potato is tender, about 3 minutes. In a mixing bowl, whisk together the eggs and sour cream or yogurt. Stir in the goat cheese, if using, sun-dried tomatoes, thyme, chili flakes, and black pepper. Stir in the thawed spinach and sweet potato mixture. Divide the egg mixture among 12 standard-sized, silicon or greased metal muffin cups and bake for 20 minutes or until the eggs are set. Let the egg cakes cool for a few minutes before unmolding.